Sometimes I am told my caveman beard and Grizzly Adams look can be a bit intimidating – perhaps even scary. If you know me, of course you also know that not only do I lack the skill and stomach for fighting, I am also so slow that I can’t even run away if things take a turn for the worse. But, alone in the outback, looking like you might have the ability to transform into a wolf has its benefits. 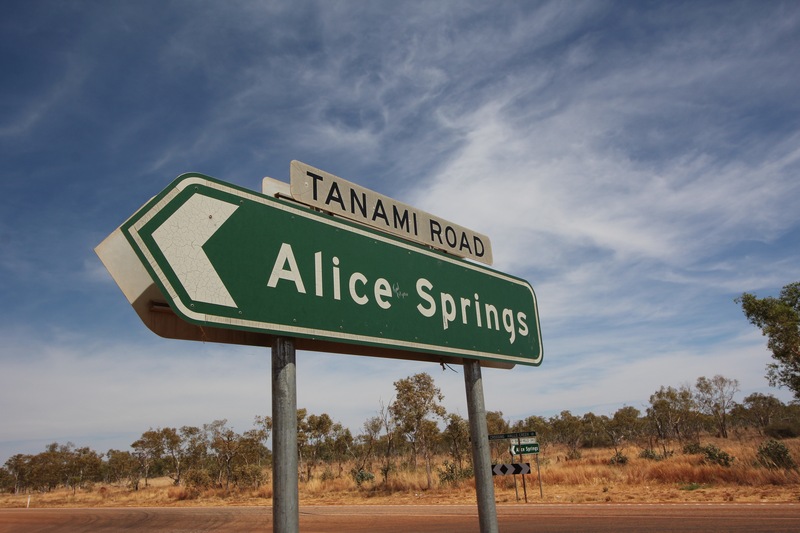 Take, for instance, the other day when we set out to travel from Halls Creek, WA to Alice Springs, NT, on the famed and dusty Tanami Track. By now Miranda and I have grown confident in our ability to venture into remote places. We regularly carry heaps of water (read: 200+ liters), plenty of food, and other necessary emergency gear, such as Oreo cookies. 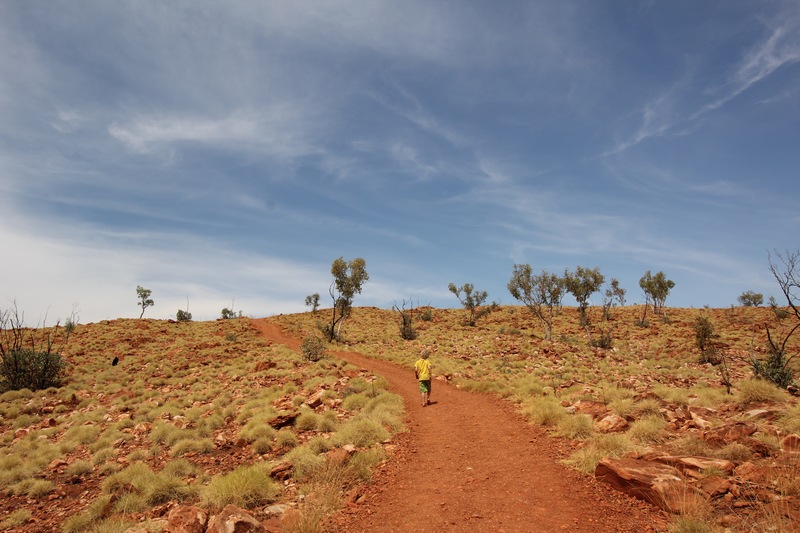 The Tanami was our most direct route to The Red Center and also offered a chance to see some beautiful remote outback areas as well as the infamous Wolfe Creek Crater. Although water, Oreos and other emergency gear are important, the key to tackling the Tanami for us would be fuel planning. The track is about 1,100kms long, from Halls Creek to Alice Springs, and our lovable Cruiser Cave Lion can travel about 650kms towing on dirt roads. We have two jerry cans that, collectively, can provide an extra 200kms. There’s a stretch of the track that is about 700kms with no fuel, so filling up our tank and jerry cans at the right places along the track would be essential. We began our journey by rolling into Halls Creek (pop 1000) early Monday morning and pulling into a dusty fuel station. Closed. The sign actually read: “Closed Friday, Saturday, Sunday, and Monday 🙂 ” Hmmm, thinking maybe it would be a bummer to arrive in Halls Creek on Thursday. We did eventually find fuel elsewhere and headed out towards the first landmark on the Tanami, Wolfe Wolfe Creek Crater. Wolfe Creek Crater really and truly is in the Middle of Nowhere, Western Australia. It’s actually so remote that it’s the kind a place where a 50,000 ton giant meteorite can smash into the earth and white Australians don’t notice until an aerial survey in 1947. Wolfe Creek is maybe 200 kilometers from Halls Creek, 170kms of which is a corrugated dirt track and the last 30kms is a super corrugated dirt track. Scientists know the Wolfe Creek Crater from its creation – a giant meteorite that struck the earth 300,000 years ago. Australians, though, are far more familiar with a horrific murder that took place here some years ago, and was retold in Texas Chainsaw Massacre fashion. The basic plot: some backpackers go camping near Wolfe Creek Crater and meet a madman who doesn’t take to outsiders; he then acts on his feelings. It’s hard to describe the fascination among some folk we have met with this movie. The closest comparable film from home is Deliverance, and even though we were thousands of miles away from Tennessee, I couldn’t get the famous chords from Deliverance out of my mind as we headed down the long, dirt track to Wolfe Creek. And so we headed down the corrugated track to Wolfe Creek Crater, and, not surprisingly, that’s where our trip started to get weird. After a picnic during which Lake and Finn absorbed all possible scientific information about meteors, meteorites, comets, craters and the cosmos, we prepared to leave. That’s when Miranda noticed the shock on our camper appeared to have met a horrible end. I crawled under the camper and did what any outsider stranded in Wolfe Creek would do: I gingerly tried to place the shock back where it should be, closed my eyes and hoped it would just stay, and we could drive away. No dice. …am waiting with baited breath…!